On August 6th, 1945 an atomic bomb was dropped on Hiroshima, Japan by the United States as a way to force surrender. The explosion wiped out 90 percent of the city and immediately killed 80,000 people. The bomb was dropped because of Japan’s refusal to surrender to the Allied powers. The dropping of the bomb “Little Boy” may have stopped the war, but it caused significant problems for innocent people living in Japan during the time of the the bomb dropping, giving them radiation poisoning and that caused cancer or other medical issues later on. Though the dropping of the bomb on Hiroshima had one very major pro, it also had many cons. Working on these new bombs was a group of American scientists that were being funded by the U.S. government, which was scared of weapon research being conducted in Nazi Germany. This program came under the joint responsibility of the office of Scientific Research and Development and the War Department. This program started about the same time was the Pearl Harbor attack, and it was codenamed the Manhattan Project after the borough of Manhattan in New York City where it had its first headquarters. Its aim was simple: to build an atomic bomb before the enemy did. Work on the Manhattan Project was soon under way between the Americans and the British. There was an added urgency to their work since both sides thought Germany was very close to building and atomic bomb. However, what no one in the U.S or Britain knew at the time was that Germany had actually decided not to build an atomic bomb. In November 1942, the head of the Manhattan Project, General Leslie R. Groves, and the project’s top scientist, Dr. Robert Oppenheimer, chose a site for their headquarters at Los Alamos, a small town in the mountains of New Mexico. It was chosen because it was far away from large towns and cities, and there were desert areas so the explosions could be set off secretly. The total cost of the project was estimated to be $2 billion; it also needed a lot of people. In 1944, around 129,000 people were working on the Manhattan Project, but only a few knew what they were building. The Los Alamos laboratory produced two atomic bombs, each of a different type. One used uranium to produce and explosion and the other used plutonium. The nicknames given to the bombs were Little Boy, the uranium bomb, and Fat Man, the plutonium bomb. Before using them, it was decided that the bombs needed to be tested first. The ground that they were being tested on was codenamed Trinity. The Trinity Test took place at dawn on July 16, 1945. America’s atomic bomb worked: A deadly superbomb had been created. By early 1945, Germany was close to defeat. Hitler killed himself in April, and on May 8, Germany surrendered. The war in Europe was over, but the Pacific war between America and Japan raged on. On July 21, 1945, five days after the Trinity Test, President Truman gave the go ahead for the atomic bomb to be used, while he was still at the Potsdam Conference. Before the Potsdam Conference ended, Japan was given a chance to surrender. Japan refused the Potsdam Declaration, even though the Allied countries warned for “utter destruction” if they refused. Four Japanese cities were chosen as targets. They were, in this order, Kyoto, Hiroshima, Kokura, and Niigata. Objections were raised about bombing Kyoto, an ancient city of great religious importance to the Japanese, so it was removed from the list. Hiroshima became the first choice. On the afternoon of August 5, 1945, President Truman gave the order to drop the atomic bomb on the city of Hiroshima. Hours later, at 2:25 A.M. on August 6, a B29 bomber took off from an American airfield on the pacific island of Tinian, 1,700 miles from its target. On board of the plane was the Little Boy atomic bomb. Flying behind the bomber were two observation planes carrying cameras and scientific instruments. The Enola Gay reached Hiroshima at 7:30 A.M. The weather was good, and the American bomber circled in the bright, cloudless sky at a height of around 31,000 feet above the city. At 8:15 A.M., Little Boy was dropped on Hiroshima with no warning given to the 350,000 inhabitants. To them, it was an ordinary Monday morning. Then there was said to be a sudden, blinding, flash. The bomb exploded 2,000 feet above the Shima Surgical Hospital, sending a huge fireball roaring outward. A violent shockwave shook the area and a mushroom shaped cloud of smoke appeared underneath the Enola Gay and over the city of Hiroshima. Inside the B29 bomber Enola Gay, flying rapidly away from Hiroshima, American airmen looked at the destruction that they had left behind. As they flew away, one of the Enola Gay’s copilots wrote in his logbook, “My God, what have we done?” The explosion immediately wiped out around 90% of the population of Hiroshima, and killed about 80,000 people. Many things happened very quickly after the bomb went off over Hiroshima. One minute after, at 8.15 A.M. in Japanese time, US bomber Enola Gay released the nuclear bomb ‘Little Boy’ above central Hiroshima. The 9,000 pound Uranium235 bomb took 43 seconds to fall from the aircraft, which was flying at 31,060ft. The aircraft travelled 11.5 miles away before it was buffeted by shock waves from the blast. The aircraft, flown by Colonel Paul Tibbets and 11 other men of the United States military forces, had just dropped the first atomic bomb used in combat. Due to crosswind, the bomb missed the aiming point of the Aioi Bridge by approximately 800 ft and detonated directly over Shima Surgical Clinic. One minute after the bomb was released from the plane, it exploded 2,000 feet above the clinic in a blast equal to 1215,000 tons of TNT, destroying five square miles of the city. When those who had survived the mysterious pikadon (Japanese for “flashboom”) picked themselves up from the ground and looked around, they were met by a scene unlike any they had ever witnessed before: nearly every building in the city had been completely flattened, dead bodies covered the ground, and survivors stared at the ruins in confusion. An hour after the detonation, the remains of Hiroshima were still burning. As well as the tens of thousands dead, an estimated 70,000 people were injured, because the impact flattened the majority of the city. 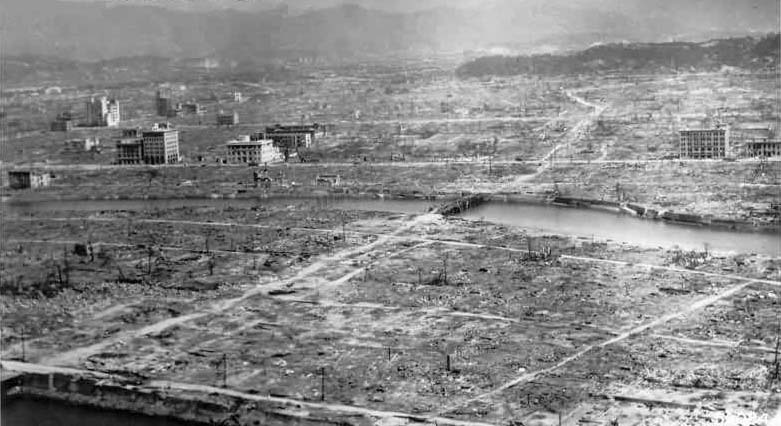 Some of the reinforced concrete buildings in Hiroshima had survived the blast, and as the bomb detonated in the air, it was directed downwards rather than sideways. Over 90% of the doctors and 93% of the nurses in Hiroshima were killed or injured, as most had been in the downtown area that received the greatest damage. The hospitals were destroyed or heavily damaged, hindering aid to the injured. Around a decade after the attack in Hiroshima, the long-term effects suffered by atomic bomb survivors began to become apparent. The increase in cancer incidences was first noted in 1956, and shortly afterwards, tumor registries were started in both Hiroshima and Nagasaki to collect data on the excess cancer risks caused by the radiation exposure. Among the effects, one of the most deadly was leukemia disproportionately affecting children. An increase in leukemia appeared about two years after the attacks and peaked around four to six years later. Around 1,900 cancer deaths can be attributed to the aftereffects of the bombs. An epidemiology study by the Radiation Effects Research Foundation states that from 1950 to 2000, 46% of leukemia deaths and 11% of solid cancer deaths among the bomb survivors were due to radiation from the bombs. The bombing of Hiroshima is a very controversial subject. There is no telling whether the idea to bomb Hiroshima was a good idea or if it caused more death and destruction than needed to stop the war. President Truman dropped the bomb for other reasons than for just to end the war. He also wanted to show the Soviet Union the power that the U.S. had. The dropping of the bomb over Hiroshima had one major pro with many cons. Mia Crisafulli is a junior at Clayton A. Bouton high school. Mia wrote this essay last year for Mr. Gladd’s class and believed that she should share this beautiful work of art with the rest of the student body and administration.